In the Office 365 admin center, search for tiles or use the left navigation pane by choosing Settings > Organization profile > Add custom tiles for your organization. Click Edit, and Choose + Add a custom tile. Enter a Tile name for the new tile. The name will appear in the tile. We recommend using KLS, the abbreviation for the KnowledgeWave Learning Site. Enter a Description for the tile. Your users see this when you select the tile on the My apps page and choose App details. Enter an Image URL for the tile. The image appears on the My apps page and app launcher. We provided an image for your use. 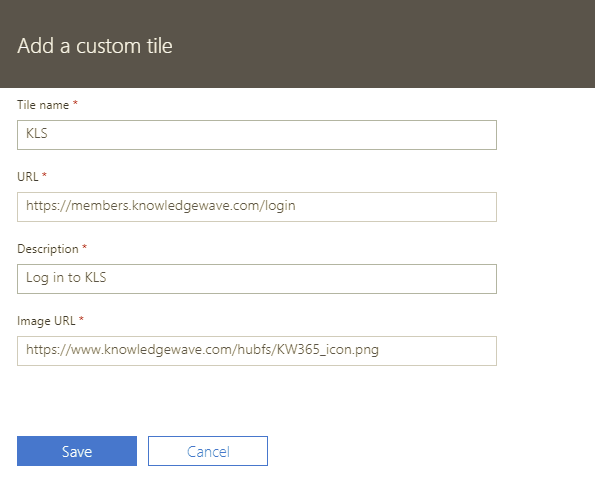 You can link directly to this URL, or download the image and host it in a location of your choice: https://www.knowledgewave.com/hubfs/KW365_icon.png If you prefer a to use a white icon to match the Microsoft tiles you can use or link to this image: https://www.knowledgewave.com/hubfs/KW365_icon_white.png, however, if you have the newest app launcher experince enabled you should not use this white icon. TIP: If you are creating your own image, the image should be 60x60 pixels and be available to everyone in your organization. For example, you could store an image in a library on a SharePoint site and generate an anonymous guest link to use as the URL. You may need to first enable external sharing for this to work. Choose Save to create the custom tile. Your custom tile now appears in the app launcher on the All tab for you and your users. NOTE: If you don't see the custom tile created in the previous steps, make sure you have an Exchange Online mailbox assigned to you and you've signed into your mailbox at least once. These steps are required for custom tiles in Office 365. IMPORTANT: Both you and your users need to perform these steps to promote custom tiles from the My apps page to the app launcher.